Under Direct Access I only see the Desktop and The Windows profile folder. I need to add a file under C:\\ drive. How do I do that? Re: How do I add a file from C:\\? 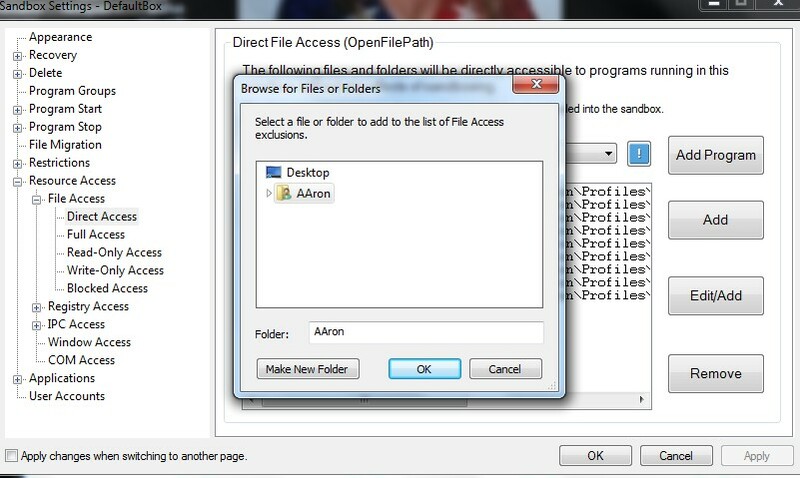 Under Direct File Access in my Sandbox settings, if I click Add I can browse all files and folders on my machine. Is that not the case for you then? I did a clean install and using all default settings with the latest Sandboxie version. This is what I see when I click Add. I just clicked the Edit/Add button and added these paths, but it isn't storing my corrected words from the browser.